The Bulletin board within the workplace is a focal point for the employers and staff to be able to interact. Workplace communications tools, methods and techniques are highlighted with the ability of the bulletin board to allow for communication and interaction within the workplace. A bulletin board does more than just let a person pin up picture cutouts. It is a space that must be enhanced with bulletin board pictures and themes as well as regular upgrades to keep everyone interested in what has been put up. Bulletin board decorating ideas could include employees contributing bulletin board pictures and important lists that could benefit the other employees. 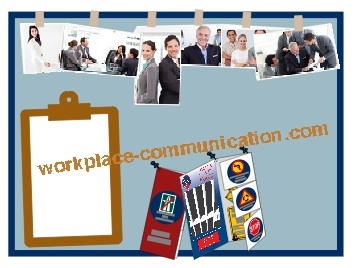 Fun categories for workplace bulletin board ideas could include staff bios, their pictures as well as other materials expressing the company culture and individual personalities. Tips and Ideas for creating better notice boards! Researching your ideas will get you started on the right path. Why not search through a variety of related images on the internet and become inspired? Check out posts on You Tube. Tweet your thoughts and ideas to friends and get their feedback. Observe what other individuals in a similar setting are doing and then tweak these ideas to make them your own. Have a brainstorming session with friends, family or co-workers. Remember that new ideas often come from the most unexpected sources. Poll the workers in your office. When in doubt, ask for input as to what they want to read on the bulletin board. Find out what their questions are, where their concerns lie and which issues are really important to your readers. Do not insist on keeping everything serious and monotone. Liven things up! Humor will get you much further in life! Create a contest for readers of your bulletin board. Keep a journal to list all of the different ideas that spring into your mind throughout the course of a day. Interview staff members from different departments of your company. Chat with management. Use the information to create content that is low-key, interesting and fun for everyone to follow. Have a Q&A with interesting and relevant questions about topics that exist outside of work. Initiate debates among the staff that allows them to tackle contentious issues and then post the highlights of these discussions on your bulletin board. Review past misses, failures and achievements, but keep it positive by focusing on the achievements and accomplishments that your team has ‘brought home'. Share information related to important milestones. Set goals and identify target dates for these goals to be achieved. Let others see how well they are doing by providing updates on these individual goals. Have a guest spot or regular feature/column posted on the company bulletin boards. Invite office members to contribute material as the ‘guest' writer of the week. You may need to institute certain guidelines and make sure that the information is appropriate for your target audience. Announcements! Build teamwork and team spirit with announcements that you post on the bulletin boards. Make sure that all accomplishments and achievements are given proper recognition. You can include family, personal and professional announcements on a company bulletin board. Just be sure that you have designated posting areas that are reserved for each type of public announcement. Themes and contests go hand in hand! Themed Contests are a great way to get others involved. Encourage your team to assist you when you are trying to think up new themes. This is a perfect way to ‘ring in' any holiday. Use the themes to help create the layout and ‘look' of the bulletin board. 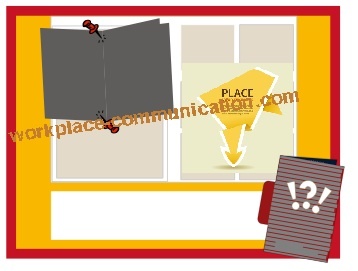 Bulletin boards are the ideal message center to convey topical and current information regarding workplace issues. This will provide the one location where any employee can come and find out the policies and rules that govern behavior, conduct and performance at work.